Baby faced, curly haired, charismatic and just the right amount of attitude…is it any wonder that we love Karan Wahi? Through each role, each character, he has managed to win our hearts over and over again and it wouldn’t hurt if all doctors looked like him either! So, did you know that this gorgeous actor collects Ganesha idols?? No?? 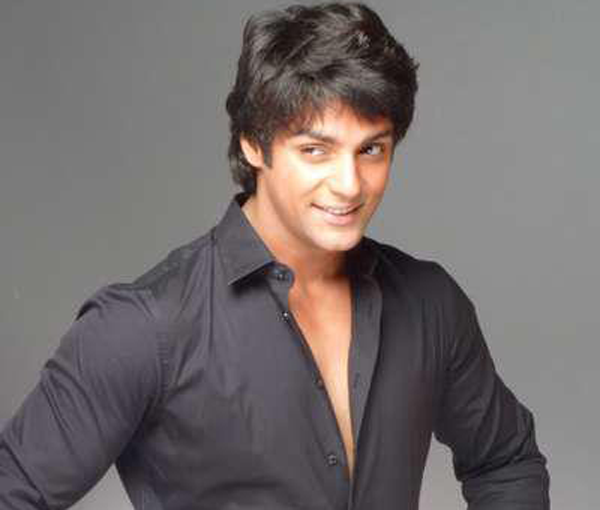 Well…read on because this week, Karan Wahi talks to Tinsel Gupshup about his “Ganesha Pitara”! TS: When did you start collecting Ganesha idols? How did this interest develop? KW: I have been collecting Ganeshas for a few years now but it has been a while since I bought my last Ganesha because there is just no more room in my house to keep them. I feel that Ganeshas come in so many different shapes and sizes and there is no particular reason why I started collecting them in the first place. I remember, I had gone to get a Hanuman idol for my mandir and I saw all these different Ganesha idols so I bought a few and since then I have not been able to stop collecting them! Finally, I did have to stop because there is just no more room. So, it is an interest that just started on its own. 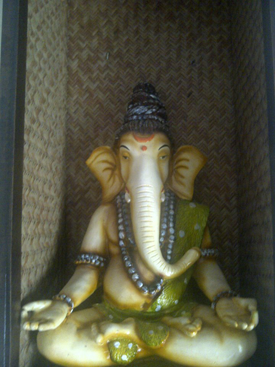 I keep redecorating and changing my house and in my present place, the Ganesha idols are a huge part of the interiors. So, all my Ganeshas actually add to the feel of my house. TS: Can you tell us a bit about your collection? How many idols do you have? KW: Ummm…I think I have approximately 100 idols and they are in all different shapes and sizes. I have “Bal Ganeshas”, very cute Ganeshas, funny Ganeshas, Ganesha flying a kite, an idol that glows in the dark, a huge lamp with Ganesha on it, an idol of Ganesha on a rocking chair…so all kinds. 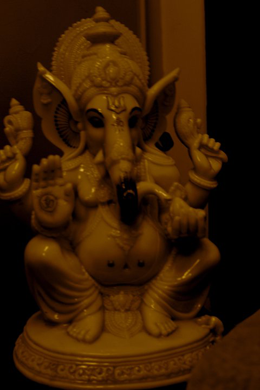 The “glow in the dark Ganesha” is probably the largest one, it is about one to one and a half feet. I do have idols in Glass and Crystal but I prefer them in plaster of Paris because you can’t really make out the shapes clearly in Glass and Crystal. I have personally made wooden boxes that are fixed on the wall and the idols are placed in them. 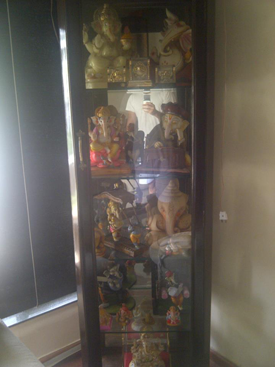 Then of course, I had this glass cabinet made to place all the idols in. I also have another glass cabinet where I place all the smaller idols…so I take a lot of care to ensure that they are placed properly and safely. A lot of people say that you should not have too many Ganeshas at home…I think it’s because Ganeshji should be kept in a mandir and since all my idols are placed in my living room, technically they end up being show pieces, but like I said, I am very particular about taking care of them, cleaning them and the cleanliness around them. So I really look after all my Ganeshas. TS: What is the most unusual idol in your collection? KW: Hmmm….let me see…well, I think the Cricket one! I bought this idol of Ganesha playing Cricket. Wait, I think the most unusual one is probably the “Shiv ling Ganesha.” I have never ever seen that anywhere. 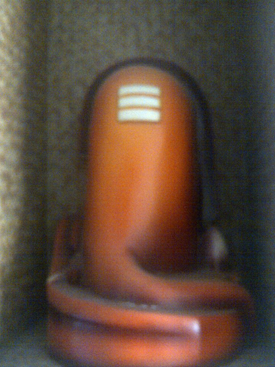 It is actually an Orange Shiv ling with the “Soond” (trunk) on it so you can distinctly make the Ganesha out. I have seriously never seen anything like it before. TS: Which is your most favorite idol from your collection? KW: Well…all of them are very very special to me. There is a saying that when you go to collect a Ganesha, you don’t choose the Ganesha…rather he chooses you, and I believe that! So, when you enter a shop where the idols are sold you should always take or buy the idol that attracts you at first glance or one that you are drawn to in the first look. You may see really expensive or exclusive idols but you should always buy the idol that you really really like and get drawn to. That is how I have bought all my Ganeshas so all of them are extremely special to me and I can’t pick one favorite. TS: Apart from India, have you ever picked up any Ganeshas from any other countries? KW: Funny thing is that since I have started collecting Ganeshas I have not been abroad…so all my idols are either from Delhi or Mumbai. KW: I don’t carry any idols on me. There is one silver baby Ganesha that I have kept in the mandir. TS: Do you keep Ganapathi? KW: Every year I think about keeping Ganpathi but then for some reason I am not able to. Well firstly, I don’t know all the rituals that need to be performed while keeping Ganpathi and secondly I live alone and there must to be somebody at home with him all throughout. I believe that when I keep Ganpathi, I would like to do everything in the right way. Maybe when my parents come to visit me I will try and bring Ganpathi home. wow...that is such an interesting collection ... 100 idols...superb... loved it !!!! Namaste to Ganesha n luv u Karan..